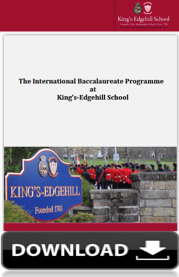 King's-Edgehill School | The Benefits of I.B. The wonderful thing about striving to be more is that you never know where you might end up. By offering the International Baccalaureate programme which is rigorous and internationally recognized, our students are able to pursue post-secondary education virtually anywhere in the world. Over the years, we have introduced many courses at the IB level as teacher and student interest has warranted. At times, the depth and breadth of the programme can be intimidating for students, but there are many aspects of the IB which initially appealed to the staff in 1981, and maintain our interest today, including the universality of the programmes and the wide selection of subjects available. There must surely be some advantages to a programme that is growing at such an incredible rate and is becoming more and more recognized as a desirable standard. We have had students transfer here from other IB schools, a move facilitated by the common curriculum. Some of our past graduates have used their IB credits to gain admission to the University of Strasbourg, Oxford University and to the University of Paris, although most of our students do not go so far afield. While universities globally recognize the strong value of the IB Diploma, there is variance as to scholarship levels and advance credit policy. At present, some universities will give advanced standing (meaning the IB student may go into a second-year course) or advanced credit (an actual credit). Check the calendar of the appropriate school to find out the policy. Speaking with alumni of King’s-Edgehill School, however, gives us our best reasons for continuing to offer the IB Programme. Many of these students have found themselves well prepared for post-secondary courses after the training of the IB curriculum. One of the advantages most often mentioned is the discipline required to meet deadlines. Our staff also enjoy the challenge of the globally-oriented curriculum, and seeing our students meet or exceed the level of other students throughout the world. Our alumni can attest to the advantages of an IB Programme. They say they found themselves well prepared for post-secondary courses and had developed the discipline required to meet deadlines. How else does the IB Programme at KES prepare your child for university? Find out here - Download our IB Programme Guidebook.